Bristol Rovers is always a trip I never look forward to, it could possibly be that the games near enough always ends in defeat or as a 0-0, or the fact I've only seen us score twice in my 6 visits, or it could possibly be that a bunch of their fans are huge idiots. 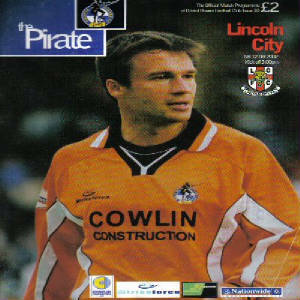 On the visit first of two visits in 2007, me and a few friends were walking to the ground and some guy threatened to stab us if we weren't Rovers fans. This sort of thing isn't exactly rare and has happened in all my visits there. Not to forget the constant abuse from several home supporters who never seem to watch the match. The police also don't seem to mind these idiots throwing stuff at away fans, it's certainly not a ground to take your family to. Getting to the ground is relatively easy once you're in Bristol, although it is street parking for the majority of away fans. You'd also be hard pushed to find a pub that will let away supporters in as well, thankfully I don't drink so this was never a problem for me. Getting to the ground there's not a lot to do, the club shop is actually inside the club gates so you can't really look around that unless you get there early enough. Other than that there is nothing around the ground to do. The view from the terraced away isn't exactly great, you struggle to see what's happening down the other end of the pitch but the view of the end you're at is decent. If I had to be honest, I would recommend the seating over the terrace because it offers a better overall view of the action. The away fans share the terrace with home fans. This stetches all the way along the pitch and has a seated section above it. Having been in that seated bit before the League game in 2007, it offered a great view of the action but I don't know what viewing the match would be like from up there. 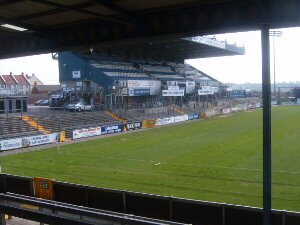 From my mini-tour of the ground before the game, the view looked fairly decent from this stand but it was ruined by some posts. The stand opposite away fans is virtually a cricket pavillion, a stand that looks well and truly out of place in a football ground. 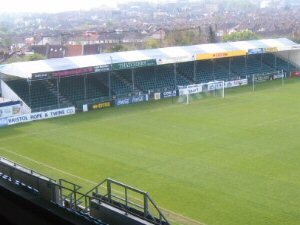 The final stand which is also shared between home and away fans, is a temporary stand with a roof. 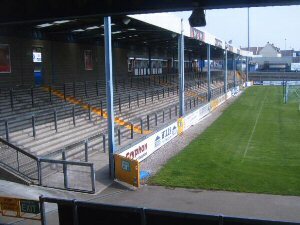 The action is highly viewable from here, and you'd be glad you were in here when it starts to piss it down, trust me, Lincoln fans know from their visit there in 2005/6. 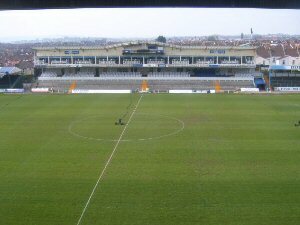 The atmosphere at Bristol Rovers is below average. They only seem to have one song and Rovers' fans only seem to sing when they aren't losing. In my 6 visits there I never heard them singing when they weren't winning. Overall I rarely enjoy my trips to Bristol Rovers. I never feel safe around the ground and is just a horrible experience. Hopefully the all-seated version will be a better experience.